In addition to the Monday evening meditation group meetings, the Bear River Meditation Group regularly offers half and full day retreats which are listed below. For more information on the regular weekly meetings and updates on the focus of Dharma discussions at those meetings, please go to the Weekly Schedule. Meditation instruction is available at our regular Monday evening meditation group meetings as well as at retreats. Please contact us for more information if you are new to this form of meditation practice and plan to join us. Full and half day retreats are planned throughout the year. These retreats are led by Senior Teachers of Buddhism from Shasta Abbey as well as monks from other temples within the Order of Buddhist Contemplatives. The remaining retreat dates for 2018 and schedule for 2019 are listed below. More information on the focus of individual retreats will be posted as it becomes available. All retreats and activities of the meditation group are offered free and are open to all who would like to attend. Donations, generally referred to as Dana, are gratefully accepted to support the activites of the meditation group and to help support the monastic community of Shasta Abbey Buddhist Monastery. More information about each event will be posted as it becomes available. Reverend Master Meiko Jones, a Senior Teacher from Shasta Abbey Buddhist Monastery will join us to offer a full day retreat focused on the Buddhist Precepts. She will give a Dharma Talk centering on the wisdom contained in Dogen’s work, the Shushogi which is comprised of essays on the five forms of guidance and practice emphasized in his teachings. In discussion we will explore together how we apply the precepts in our daily lives. RM Meiko has suggested that we might each read the Buddhist Precepts and consider one over the next days before the retreat. We will talk together about our observations and experience with the precept we have selected to work on during one of the discussions. The day retreat will include periods of meditation, ceremony, the Dharma Talk, coffee and tea, and opportunities for questions and discussion. Please bring your own brown bag vegetarian lunch. Meditation instruction will be available for those new to the practice. The day’s retreat is free, though donations to the monastery are appreciated. Please contact us if you plan to join for the retreat or have questions. 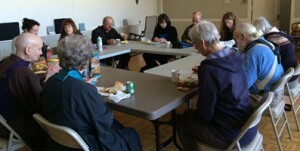 Half Day Retreat with Reverend Vivian Gruenenfelder, a Senior Teacher of Buddhism from Shasta Abbey. The meditation group will go up to Shasta together for a Continuing Practice Retreat. Those wishing to go should contact the Abbey Guestmaster. We will coordinate ride-sharing for the trip. Reverend Master Daishin Yalon, Vice Abbot of Shasta Abbey Buddhist Monastery will join us for the full day retreat. Full Day Retreat with a monk from Shasta Abbey. We will celebrate Rohatsu on the night of December 7th and morning of December 8th, the times and location to be announced. Potluck Dinner and Offering Ceremony with a monk from Shasta Abbey. Additional events are planned by the meditation group throughout the year including day hikes, movie nights and pot luck meals. This year we are also looking into taking a trip to San Francisco to go to the Asian Museum. If you would like to be notified of such events, please contact us to be put on the email notification list.